A customer favorite for its fashionable design, durability and extensive collection of matching products, the Veranda line features our heavyweight Gardelle woven polyester fabric and special water-repellent and resistant backing. All Veranda covers are backed by a three year warranty. Find out below why buying a cover from us is one of the best choices you can make. When you buy a Classic Accessories grill or patio furniture cover you are not just getting a cover; you're also purchasing peace of mind. Not only will your grill and patio furniture be protected from the elements, but you'll be protected with the easiest warranty in the industry. If your cover fails, for any reason, just look for us online and email our warranty department a picture of the problem and we'll send you a new one. Guaranteed. 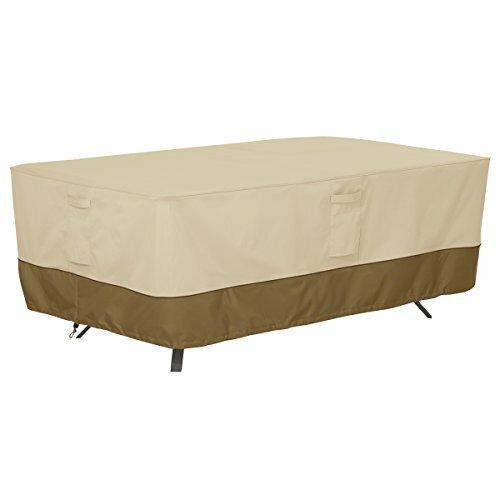 HEAVY DUTY PATIO FURNITURE COVER: Fits rectangular/oval tables up to 72 inches long x 44 inches wide.